History is written by the victors. Textbooks are influenced by the powerful. And ultimately truth is discerned by people who are willing to listen with an open mind and learn beyond a time commitment of a news scrawl or a thirty-second spot. Thus, the movie Downfall, about the last days of Adolph Hitler, presents a unique opportunity – a different perspective to a page in history often dismissed with a wave of a hand. Directed by Oliver Hirschbiegel, Downfall is centered in the elaborate bunker in Berlin where Hitler, Eva Braun, his court stenographer, Traudl Junge, and numerous Nazi officers and soldiers reside. While the approaching Russian soldiers bomb the city and kill or capture civilians that remain, the powers of the Third Reich unravel in the claustrophobic tunnels. It’s Junge’s voice [Alexandra Maria Lara] that narrates the story. In her twenties, she remains until all hope is lost. She is closer to Hitler than most, documenting his memos and dining with him and a few others. Hitler refused to allow himself to appear vulnerable, so his historic image is preserved in political arenas orating to large crowds. A rare, and unauthorized, recording of him speaking conversationally was discovered not long ago, allowing a glimpse into his personal demeanor. It’s that eleven minute tape that actor Bruno Ganz studied to portray the private man. Hitler’s advanced state of Parkinson’s disease was also evident in Ganz’s trembling hand. Because a number of the people in the bunker survived imprisonment or escaped, the script is not wholly the imagination of the scriptwriters. Historical events have been documented and verified and tragically imaged in Downfall. The most devastating being the murder of the Goebbels’ children by their mother, Magda. If one is a thinking person, one has to question why. Why was Hitler given so much power and followed by so many people? Why did Eva Braun [Juliane Köhler] marry a man like Adolph Hitler? Why did a young stenographer from Munich survive the insanity of the bunker when so many others were murdered or committed suicide? But, the most immediate question is why see this movie? 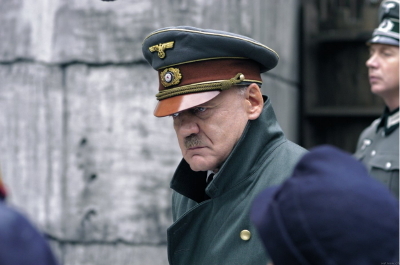 Downfall is an important glimpse into a troubled time, a devastating story, brilliantly told in possibly the only medium that could do it justice – film.